The Roanoke City and Alleghany Health Departments will offer opportunities for flu vaccination. 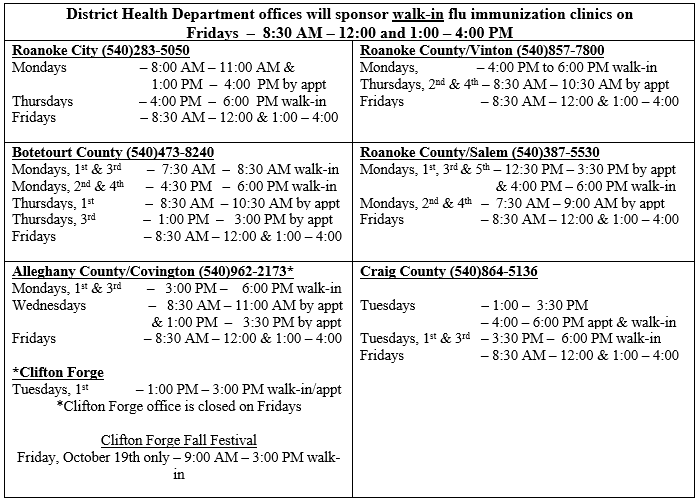 District Health Department offices will sponsor walk-in, flu immunization clinics on Fridays, beginning September 28, 2018, from 8:30 AM – 12:00 and 1:00 – 4:00 PM. Additional appointment and walk-in times will vary by office. Please check with the offices as listed below for additional information. Offices will be closed on October 8, November 12, November 21 (close at noon), November 22, November 23, December 24, and December 25 in observance of State Holidays and for trainings. For 2019 closings, please check with one of the offices closer to the end of the 2018 calendar year. Please contact your local health department office at one of the numbers listed above to schedule an appointment or get more information. Please bring any insurance cards you may have for you or your family members. Most insurances are accepted. For individuals who are self-pay, there may be a cost of up to $30.00 or please contact a local health department office to see if you may be eligible for a sliding scale discount.